Malcolm Turnbull's inability to deal with the actions of Brough, Morrison, Pyne et al, together with the Abbott legacy, have set in motion the end of the "Turnbull Adventure", writes Bob Ellis. IT WILL be noted by future historians that the “Turnbull Adventure” ended, or began to see its end, in the seven days from the second to the ninth of December this year. The 13 per cent swing against the Liberals in North Sydney; the putting back on the table of the 15 per cent GST by the yapping innumerate Morrison; the weird “rewarding losers” announcement by Turnbull and Pyne, a way of making our businessmen more daring after centuries of cowardice; the “yes and no” answers by Brough to questions of his criminality and finally, the Paul Murray interview with the roused and charismatic Tony Abbott — who thinks a billion Muslims should try harder and a billion Catholics are doing fine. All these events put Malcolm in a hole it will be hard, or impossible, to wriggle out of. Is he in charge, and if so, of what? He can neither sack Brough, nor keep him on. He cannot protect Roy or Pyne if the Slipper finger points their way. He cannot, apparently, stop Morrison from saying the money we give to Australian mothers and children must be cut to the bone. And he cannot stop Abbott calling, like Trump, for the persecution of the Arabs, a Semitic people (this is called anti-Semitism) and stirring young Muslims into blowing us up on trains and stabbing us in bus shelters at midnight. Abbott was very impressive in his interview, and showed the unrepentant, charismatic madness of a true demagogue. With the zealotry he showed as a trainee priest, he wants these heathens punished. They have not undergone The Enlightenment (neither, of course, has Abbott) and they must be dealt with severely. This utterance has enraged the Indonesians and has endangered our civilisation. 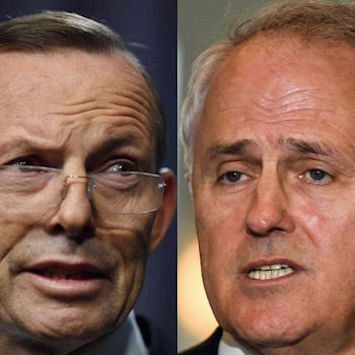 And Turnbull, the smooth-talking wuss, has no way of dealing with Abbott. He can’t deselect him, or invite him into his Cabinet, or admonish him for his mad opinions. He does not command the party he leads — forty or fifty per cent of it applaud Abbott’s craziness and there is no way of turning them round. It’s interesting how Abbott’s life, when examined, falls into a pattern — of enthusiasm, disillusion, and denunciation. He decided to be a priest, then found the Church too left wing, and denounced it in The Bulletin. He decided he was a Liberal and when he sought to ban the morning-after pill, was nearly rolled from the Ministry, whom he violently denounced in private. He backed Turnbull as leader, then petulantly resigned from his team and replaced him as Leader. He backed Hockey and Brough and Bernardi, then had to let them go. He is an enthused friend of Pell and will soon denounce him also. He spoke up for Nestor, the pederast and Hollingworth, the friend of pederasts, but will denounce them, regretfully, also soon. All this informs the sort of rabble Turnbull is in charge of and cannot control. He longingly dreams of a party like the Liberal Democrats in England, Clegg’s party, and this, the party of Abetz, Andrews, Bernardi, Murray and Bolt, is the hand he, alack, has been dealt. He cannot believe his ill-fortune and is drinking more, to judge by his red nose on Monday, than he used to. Not only the honeymoon is over, but the adventure also.